Catchy blog title aside, the ultimate water saving camping trip would be to forego bathing, and eat, drink out of tins. But for us, camping needs to be sustainable for ourselves, and the environment. 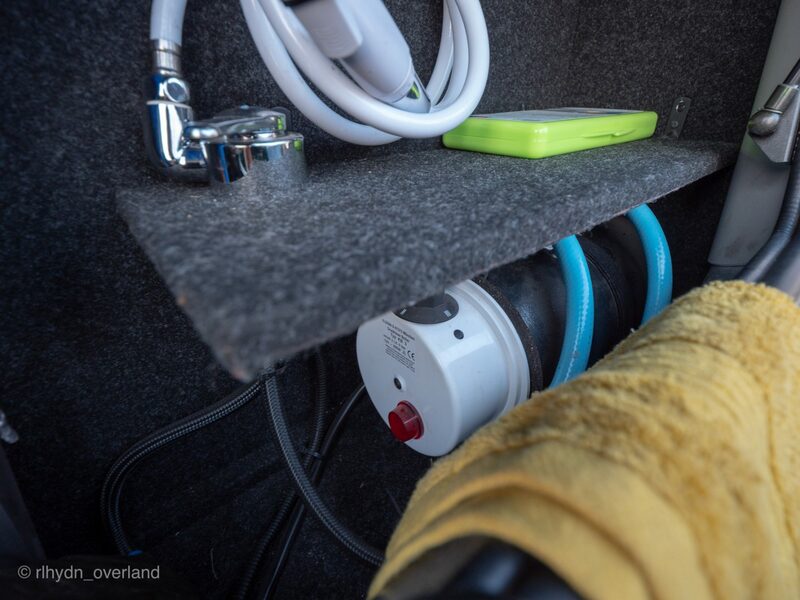 So this blog is perhaps more about how we use water on while camping. We have an on-board capacity of 80litres (or 21gallons) of water. Our longest journeys have been with less, e.g. 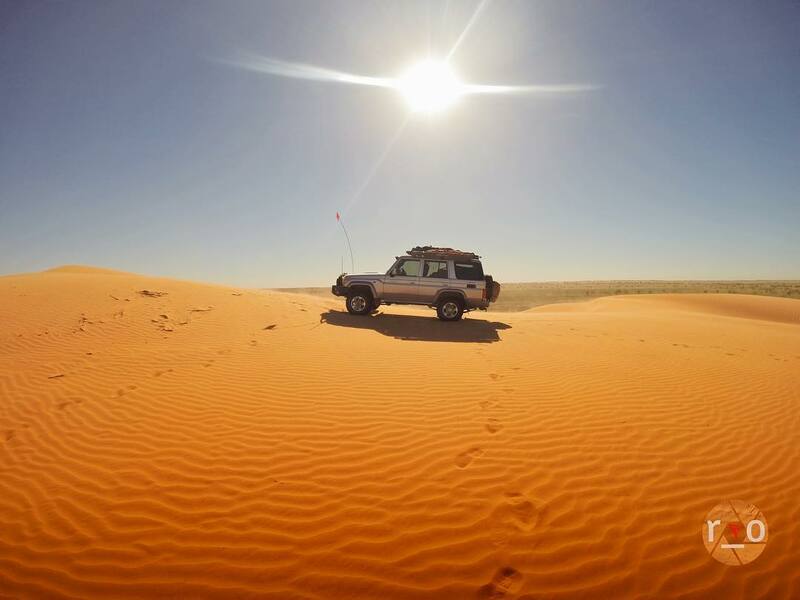 crossing the Simpson Desert in a hot May with 40L in jerrycans, and a 10L bladder purchased at Maree. Whilst we did not feel limited by that, we have always intended to comfortably roam farther, longer. When you carry your own water supply, you become succinctly aware of how much you use. Below, I will share some of our water dependent activities, on and off the road. Drinking water is omitted from these points. We use Nalgene and Platypus soft drink bottles or our camp cups. We have a Nanosilver inline chlorine filter on our tank hose (removes a lot of the bore flavour when Outback) we also have a UV Steripen and treatment tablets on board. 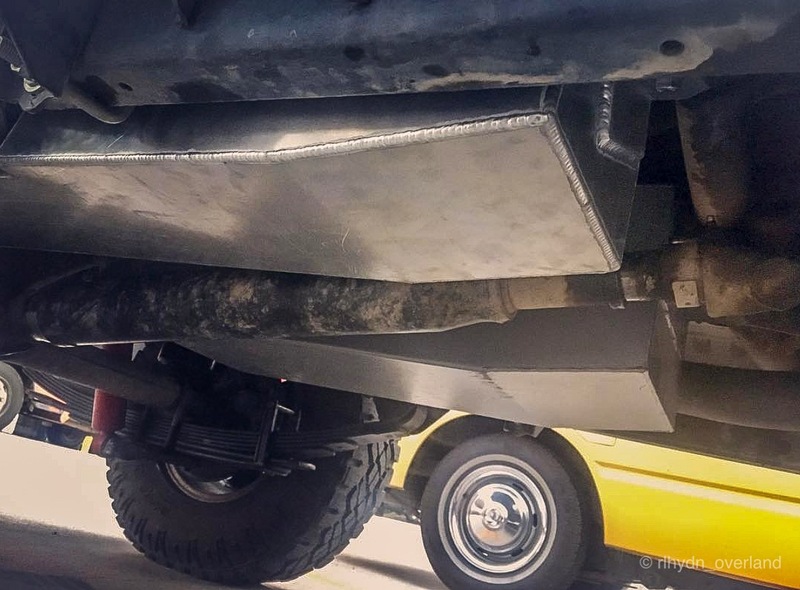 I don’t really miss showers when overlanding, but after a few days, we like to feel cleaner. 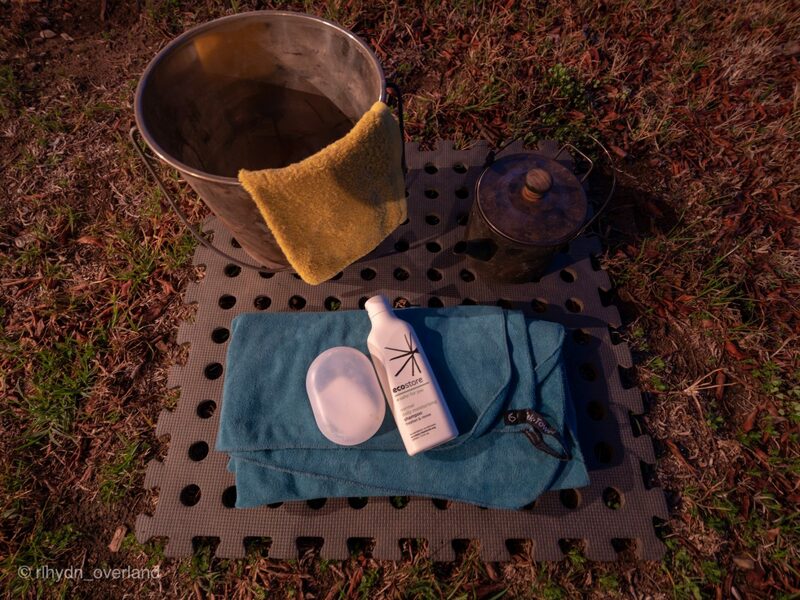 Aside from using water-free alcohol hand rub for our hands or a swim, we have tried a few camp bathroom kits. This is what we prefer. Consumption is approximated for two people. Usually boiling a full billy for morning coffee, we always have remaining water. We wait for it to cool, whilst we eat breakfast and pack up camp. Using a face washer/ flannel or small towel, soaked in the hot water, we can scrub our hands and faces and feel amazingly refreshed for the drive ahead. Teeth brushed with a mouthful or two to rinse and we’re ready for the ‘office’. Maybe the oldest method, but a billy boiled and added to bit of cold water in your standard 9L bucket is enough for a whole body scrub. My personal favourite. Using a face washer/ flannel or cup to wet my hair (or (un)gracefully dunk my head into the bucket) I will wash my hair first. Using an earth friendly shampoo, or an all purpose wash like Sea to Summit. I carry a spray bottle of leave in baby de-tangler/conditioner, so there is no need to rinse twice. All done with less than a full bucket of hot water. Under the Milky Way, beside the campfire is best, but if you have neighbours, invest in an easy to use Shower tent. Forget a spa bath, this is a star bath. 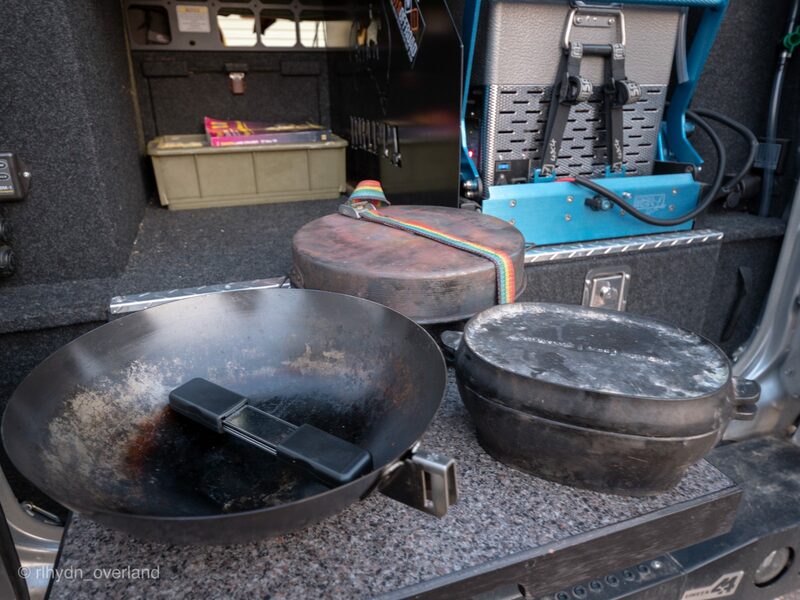 A metal seamless bucket can warm up on the fire, while dinner is cooking. I’m not going to lie, this is serious luxury. But in the heat of summer, or after many smokey, bathless nights – we want for a pressured wash. Rinsing the soot and stale sweat away, for more. We have a 12v 3L water boiler from Elgena, but there are many powered camping showers available. Ours would likely rank the smallest. With a mixer tap and shower head – I can rinse and shut off the water to lather up, before turning on the hot water for the final rinse. Our setup will provide around 8L of shower temperature water before it needs to reheat. Longer, if we use more cold water. It takes about 30minutes to heat up. Note: We do carry Wet-Wipes/Baby Wipes, we only use the most biodegradable or compostable plastic-free wipes on offer. Being a single use product – these are saved for emergency or infrequent clean-up. They usually live in the Toilet bag. Our usual choice is the Wotnot or Naty wet wipe. In our experience, natural fibres wash and wear better with minimal washes, as they’re more breathable. The disadvantage of cotton and wool is their drying time. When they eventually deserve a rinse – I need to be ready to wait for them to dry. Polyester type clothes like Polar Fleece are super lightweight and practically dry out of the bucket. I tend to pack four complete outfits, combinations of all fibres depending on the season. Ideally washing less often. Handwashing underwear using the bathwater after a bucket bath is one such camp hack. Hung to dry overnight or the next day somewhere in the LandCruiser. Else, saved for washday if we’re camped for a zero day, driving nowhere. I’ve used three techniques. I have a large dry bag that I add a tiny bit of eco wash, maybe a litre or two of water and clothes. Air pushed out, sealed, I then give the bag a serious, stress relieving massage. Rung out, the clothes are then left to sun bake. A lidded painter’s bucket works well. If you have the room, you can fill and drive. Let the corrugations do the hard work. This uses a few litres of water. And you still need the time to wring and hang to dry. If you’re going to use river water, leave your whites at home. Mine turned beige. Cooper Creek beige. Slung to dry, on the branch of a river gum. In lieu of the washbag, and space, we’ve retired our Wash Bucket. Most caravan parks or towns have them. 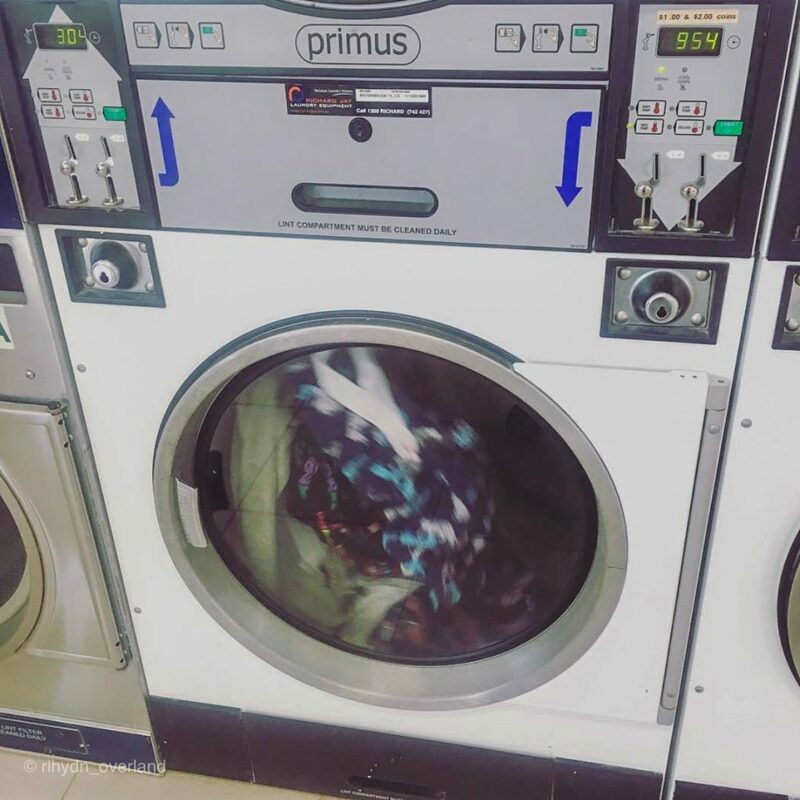 Brutally hard on your clothes but quick and they often have dryers. Cost a few gold coins and a couple of hours in town. Saving most of our clothes for a full load means you will make the most of the extremely water hungry washing machine. Whilst catching up on the Internet at the local cafe or pub. 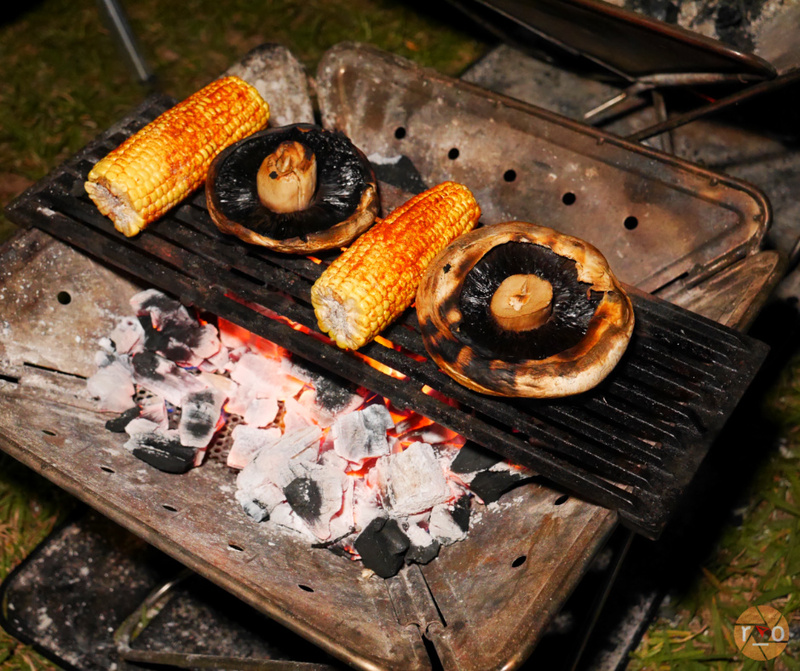 If you’re going to eat well at camp, chances are you will use a bit of camp cutlery to do so. Avoiding the cleanup has come naturally to us. Neither of us likes washing dishes, and water is precious. Making big protein and salad sandwiches, wraps, corn/rice thins AKA edible plates. Or a share plate of pre-cut food with crackers, can use as little as a knife and a cutting board. 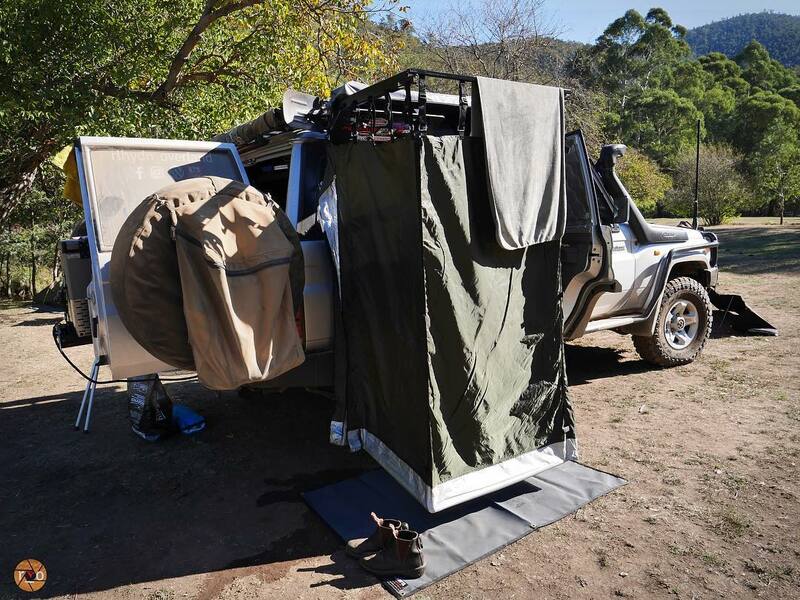 We keep a spray bottle of either eucalyptus oil surface cleaner or a mild dishwashing soap in the LandCruiser – combined with a roll of recycled paper towel or a dishcloth, and you can clean up – almost water free. 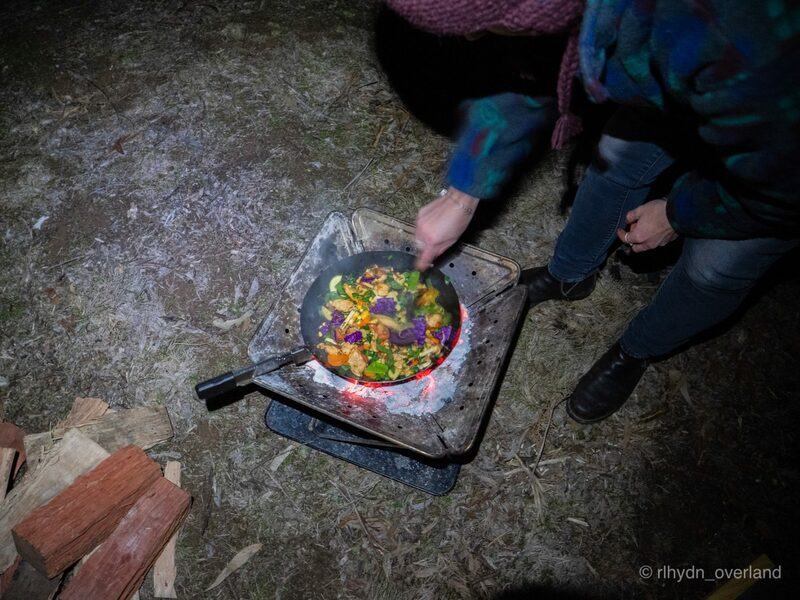 Cooking direct on the fire also negates the need for a pan. 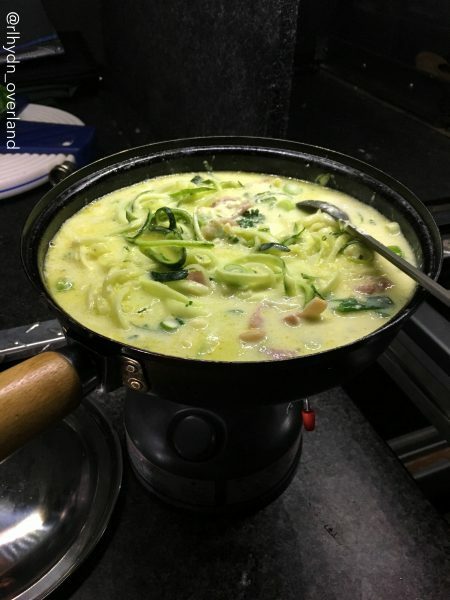 Cooking up a camp feast in one pot is easy. Too easy. We only have a single burner stove for that reason. It also means – one pot to clean. With one pot, two bowls, two spoons and maybe one serving ladle (sometimes it’s easier to pour straight from the pot) our washing up container needs less than two inches of hot soapy water to have everything sparkling clean. Casserole cooked, consumed and forgotten. 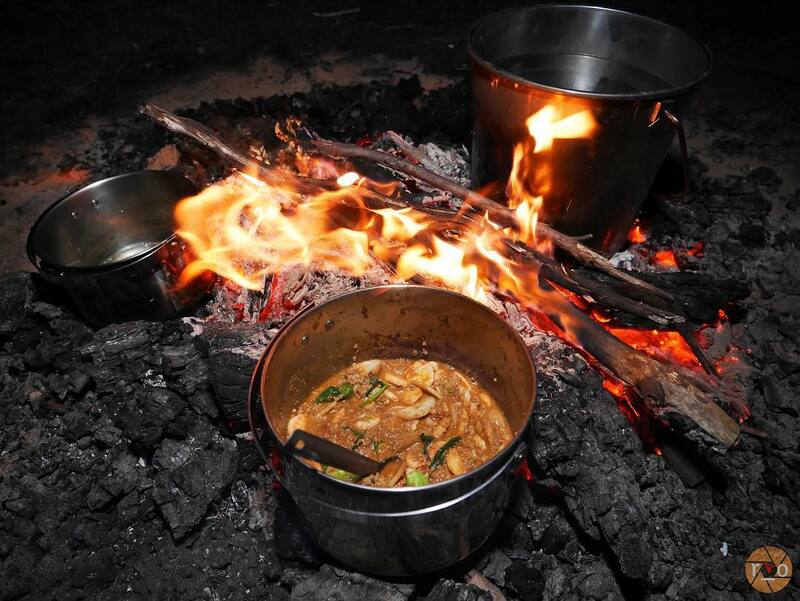 Cooking on the fire or stove with cast iron or steel not only provides a healthy and tasty flavour but also requires next to no wash-up. After removing all food, leave your pot/pan/grill/oven on the heat and add a splash of water to cook off any residual. Wipe out with paper towel and oil. We carry a stiff bristle brush for anything stubborn. Keep them stored in a canvas bag to lock in the flavour…. Or protect the rest of your kit from any soot. 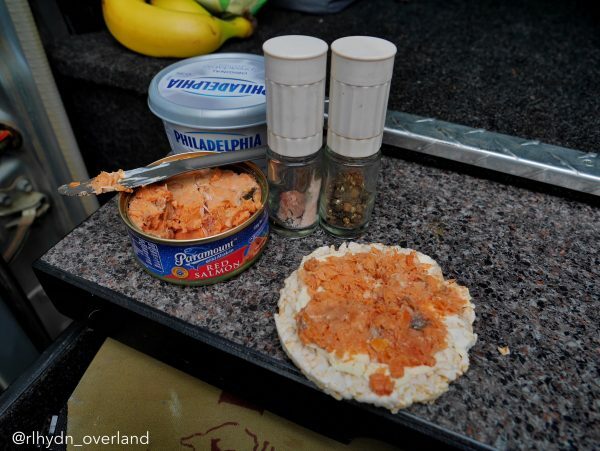 If you’re camped somewhere overnight, chances are you may have more than one meal. If a cooked breakfast is planned for the morning, why not leave the dishes for the morning and wash-up after breakfast, especially if you can store your dirty dishes safe from wildlife. If you’re like us however – you may only have one bowl each to use. We tend to wash up almost immediately after – popping the billy on the heat as soon as the cooking is finished. A cup of tea is generally in order anyway. This saves us from re-pumping the stove or letting the Stroganoff sauce congeal, and go hard in the pot. 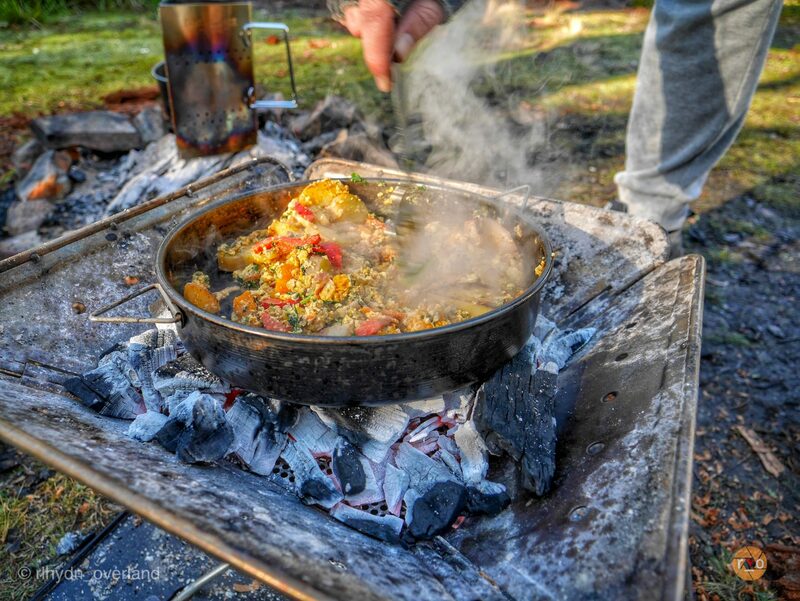 Rice and pasta make a terrific staple for camping food, they can extend that premade Bolognase or slow cooked casserole to feed the whole troop, or just the two of you for several meals. It’s thirsty though. I’ve since moved to precooked rice and pasta that can be stirred into whatever hot dish I’m cooking without the need for additional water. There are some good off-the-shelf variants available, but home cooked and sealed is probably the healthiest and produces less single use plastic packaging. 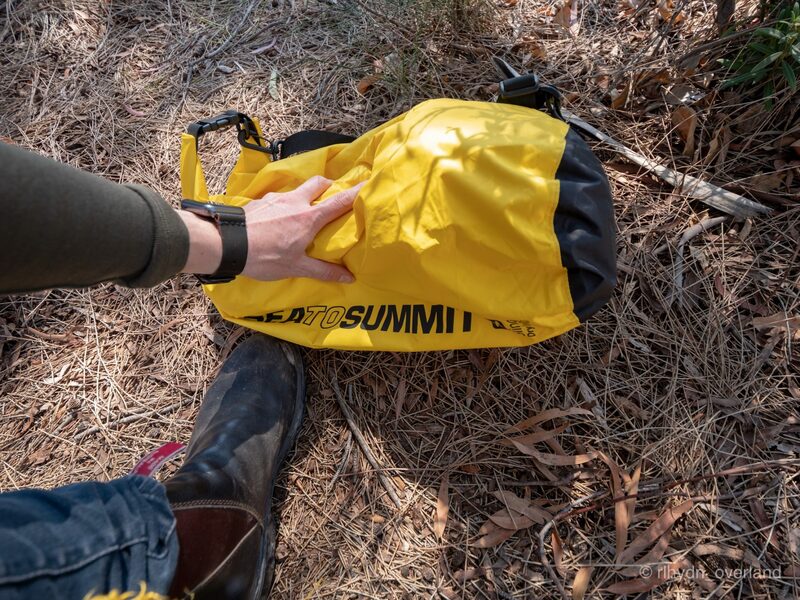 We use a hand pumped vacuum sealed kit with re-usable tough bags, picked up at one of the many 4WD Camping Shows. And that’s about it, its not clever or hugely expensive. Just a few conscious methods towards sustainable camping. Reducing waste, and staying out of town, safely, for longer. Share your techniques or hacks in the comments! We take a pressure sprayer (garden variety) when camping & mix hot/cold water & spray down, lather & spray diwn again. Uses very little water & water remaining in unit (never fill it more than 1/4 fulk next time is topped up with boiling to make it warm. That’s a good one! Definitely minimal water use, or wastage!